All of the rooms in the Studierendenwerk’s Student Halls of Residence [de] have wired access to the data network via an ethernet port. These connections are protected from attacks by a central firewall and form their own security zone. If access is required to the university’s intranet, it is only possible via VPN [de]. 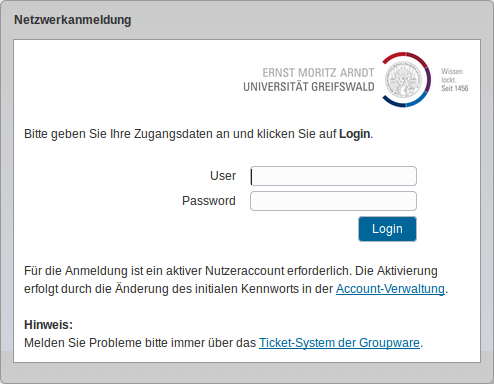 In most cases, access to online publications made available by Greifswald’s University Library is now possible without VPN, as authentication is provided via Shibboleth [de]. The university’s wifi is not available in the student halls of residence. The University Computer Centre deals with problems concerning internet connections from Mon-Fri (not on bank holidays) between 8.30 a.m. and 3.30 p.m. and on Friday between 8.30 a.m. and 11.30 a.m. The configuration settings for using the data network are provided via the central DHCP server. Therefore, please configure your PC so that it automatically obtains an IP address [de]. Systems disturbing the data network will be recognised automatically and excluded from the data network for 24 hours. If you would like to use the data network in the student halls of residence, you will be asked to enter the login details for your personal user account. Please open a browser and load the website http://connect.uni-greifswald.de. You will be referred automatically to a secure login page. If you fail to enter the correct login details on 3 attempts, your account will be locked for 30 minutes. The account administration and the University Computer Centre’s Ticket-System in Groupware are exceptions and can be accessed without a login, so that you can change your initial password, request a user account or report a problem.